With the year drawing to a close, MAG Ireland would like to take this opportunity to thank you, our supporters, and particularly our members for your dedication to defending our rights as riders. It’s been a long and sometimes difficult year, but a very important one for your representative organisation. There have been many changes internally in MAG, and of course many challenges along the way. So, as the year draws to a close, let’s take a look back at the events of 2011 as MAG reported on them. 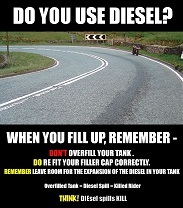 Amid the worst winter in living memory, we opened the year with news that Axa insurance was running a “six wheel policy” while elsewhere Mayo County Council got pro active on diesel spills with their “Cap it” initiative to raise awareness of the problem amongst fleet operators, agricultural users & motorists. We also announced that MAG Ireland had won a parking commitment from DCC in relation to bike parking in new developments and we launched the Bikers are Voters campaign ahead of the elections as the economic disaster triggered the collapse of the Fianna Fail/Green Party coalition. February saw MAG formally adopt our let the rider decide stance on the RSA’s proposals for mandatory long sleeved high visibility clothing for rider & pillion passenger, which in turn kick started the campaign on that issue. Meanwhile, MAG Ireland’s Training Officer, Marc O’Loideoin, embarked on the epic “Gambia on a Gapper” trip which would see him ride a Honda C90 step-through from England to the Gambia in West Africa. 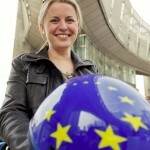 March opened with the news that the EU’s Type Approval proposals had made it to the European Parliament. There was little interest in that topic when we posted it, yet it would later become the biggest event of the year. Back in March though, the big event was the RDS bike show, and MAG Ireland’s stand was busier than ever with more than 700 of you signing the petition against PTI. Elsewhere, the National Transport Authoritylaunched the the final consultation phase of their Draft Transport Strategy for the Greater Dublin Area, which at first glance we described as a “…shockingly ill-informed document dripping with safety & environmental rhetoric, and vehemently against the use of private motor transport of any sort…” which, as it turned out, pretty much summed it up. April saw us open with Organ Donor Awareness week, while MAG Ireland’s executive was busy compiling a detailed response to the National Transport Authority. This month also saw the launch of a survey by the EU funded “2-B-Safe” consortium which claimed to seek riders views and attitudes to safety but asked some very suspect questions indeed. While the MAG board were busy trying to decipher the text of the EU Type Approval regulations, two of our number transplanted themselves to Brussels for the 2011 MEP Rideout event which was attended by, amongst others, Malcolm Harbour MEP who was in charge of the IMCO committee tasked with steering the type approval regulations through the EU parliament. It wasn’t all hard work though as our vice-chairman managed to crack a few ribs while err… crash testing an electric bike at circuit Zolder in front of the elite of Europe’s motorcycle journalists!! Here at home, MAG welcomed the announcement of a sixty million Euro roads allocation after one of the worst winters on record, and the Irish Times reported a big drop in casualties amongst motorcyclists. An internal reorganisation in MAG Ireland saw us say goodbye to our office in Inchicore after ten years and move to a smaller basement office in central Dublin. The reason? cutting costs and becoming more efficient & flexible. June also saw tens of thousands of French riders take to the streets to demonstrate against some draconian measures for, amongst others, compulsory high-viz clothing, jail terms for speeding, bigger number plates for bikes, and a ban on filtering. Here at home, the National Ride to Work Day event took place on June 20th with many riders opting to purchase a sticker in support of Down Syndrome Ireland. The month of July saw us report on a proposal to require all vehicles to be insured regardless of whether they are used on the road or not. This, and another similar proposal to force owners to tax all vehicles, even those which are off the road, continue to do the rounds in Government circles. Meanwhile, we reported on Donegal man Ryan Stewart’s legal challenge to VRTwhich resulted in infringement proceedings against the Government under article 258 of the Treaty on the Functioning of the European Union. MAG Ireland’s online shop got an overhaul, and we introduced a quarterly subscription option to help spread membership costs over the year. August though, will be remembered as the month when the Type Approval issue hit the big time after a MAG UK e-mail went viral on the Internet and sparked off a tsunami of anger amongst motorcyclists. Unfortunately, a number of myths gained currency including one which suggested an imminent ban on bikes over seven years old in urban centres. MAG Ireland was thus forced to expend considerable amounts of our scarce resources correcting such statements in the print media which in turn hindered our ability to deliver a more co-ordinated response to what was a rapidly developing situation. September saw the hysteria around the Type approval issue go into overdrive while MAG Ireland worked with our UK counterparts to help co-ordinate a weekend of protests over the 24th & 25th of September. At the same time, we struggled to counter the tsunami of mis-information emanating from Facebook, Internet forums and mailing lists about the EU regulations. 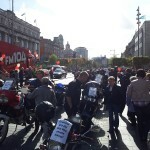 The weekend of protests opened with the MAG Ireland “Think Bike” demo on the Saturday morning which drew big crowds in a number of places including Dublin & Limerick where bikers brought the city centers to a standstill. 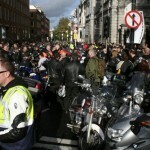 The Sunday demonstrations, organised by a number of individuals & Internet forums with the support of MAG Ireland, saw thousands of bikers turn out in truly appalling weather conditions to once again take the message to the streets. Unfortunately, the Sunday demonstrations will be remembered for the one clown who did a burnout for the TV cameras on the street outside the Dail, rather than the thousands who turned out to support the demo. Sadly, despite our best efforts, there continued to be a great deal of mis-information in the media surrounding the proposals. September also saw the MAG Ireland AGM take place, and members who turned up on the day were very much engaged in the discussions which took place around the key issues. There were changes on the MAG board plus the welcome addition of a new board member, and all involved left with renewed focus & determination to push for our rights. Meanwhile the RSA responded to the weekend of protest by putting up a page on their web site about they Type Approval and Mandatory High Viz issues, while MAG urged protesters to write to their MEP to keep the pressure on. October saw MAG Ireland help to deliver some 110,000 signatures against PTI including about 1,100 from Ireland when we joined our FEMA colleagues in Brussels to present the petition against PTI to the EU Commission. Here at home, a group calling themselves “United Bikers of Ireland” formed online and organised a demo against the Type Approval regulations for 29th October which drew in some 3,000 bikers from all over the country. While the demo itself was successful in terms of turnout, the group failed to follow it up with organised political lobbying and has since disbanded. Meanwhile, members of the Biker.ie Internet forum organised a Friday protest ride to the RSA headquarters in Ballina, Co. Mayo. While the numbers were not spectacular, the protest was well organised and a delegation was invited to discuss the mandatory high viz proposals with the RSA’s Noel Brett on the day. The MAG Ireland rep in attendance reported a constructive exchange took place between both parties. For our part, MAG Ireland responded to the RSA’s consultation on Type Approval which surfaced in the wake of the September protests, and continued to build the case against mandatory high viz by dismantling the RSA’s research on the issue, producing posters and publishing a new information sheet on the subject. November opened with the results of our web site poll on the mandatory high viz issue in which over 1,000 of you took part. 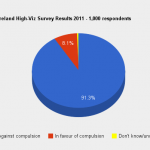 More than 9 out of 10 respondents opposed compulsion, but so many got in touch with the office that we decided to launch a more detailed survey on the issue. Meanwhile, MAG Ireland had a long awaited meeting with Noel Brett of the RSA at which we had a constructive discussion around the EU Type Approval regulation, VAT on bike gear, and Periodic Technical Inspection to name but a few. Elsewhere we reported the news that Belfast bikers got additional bus lane access, while our own NTA rejected MAG Ireland’s comprehensive submission on the same issue, and continues to believe that a motorcycle is the same as a car in terms of road usage. Given that they refuse to distinguish between the two modes, we see little scope for the sort of progressive & pragmatic thinking demonstrated by the authorities in Belfast. We should probably count ourselves lucky that the NTA doesn’t run horse racing as the greyhounds would no doubt be confused by the jumps. The Type Approval text was voted on by the IMCO committee on December 5th, but complex amendments delayed analysis of results although based on what we know it looks like PTI (or NCT for bikes) would be necessary to make it workable as it stands, while concerns remain around the delegated acts as these are open to abuse by the EU Commission which has shown scant regard for motorcyclists in the past. Budget 2011 saw the formal announcement of the much anticipated VAT increase which was immediately condemned by MAG Ireland in a press release. MAG then had a meeting with Minister for Transport Dr. Leo Varadkar T.D. 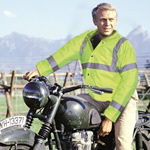 to put the case directly for VAT reduction on PPE for motorcyclists amongst other things. This issue is still on the table as we go to press. Our detailed high visibility survey drew a fantastic response from Irish riders who engaged with us in a very constructive way. At the time of writing the results are being analysed and we’ll be publishing them on the site shortly. 2011 was one of the busiest years in the long history of MAG Ireland. Much needed internal changes were undertaken against a backdrop of ominous new legislation and a renewed interest among riders in defending their rights and freedoms from threats born out of the dysfunctional attitude that bikes are some sort of “problem” that needs to be “solved”. 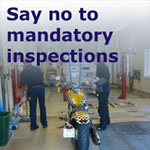 The early part of 2012 looks set to be dominated by two key issues – Type Approval and Mandatory high viz – both of which are ongoing. While these two issues are the loudest, they are far from being the only issues MAG Ireland is working on as can be seen from the campaigns section of our web site. As ever, we can only do so much with limited resources. While our reorganisation has made us more efficient, we’ve also been talking to various people on the ground and we expect to announce two new regional MAG groups by the Spring. We’ve also got solid plans to further improve our communications, and for increased efficiencies within MAG. If you’re not already a MAG Ireland member, why not join us? It’s never been more important for Irish Motorcyclists to play their part. Frequently those who are most critical of MAG Ireland are not MAG members themselves. Difficult though it is to be faced with ignorance and intransigence from the authorities, it’s more difficult still when we’re faced with ignorance and intransigence from fellow bikers who are prepared to rant and rave on-line but contribute nothing of substance themselves, and therefore damage biking for all of us. 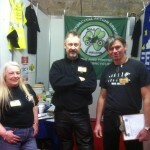 We here in MAG Ireland look forward to representing all riders in 2012 and building on the successes of the past year. We can only do what we do with the support and backing of our members. To all of you who have joined or renewed in the past year we extend our deepest thanks & appreciation. This is your organisation. You, as members, are its heart and soul. It’s your commitment that makes it all work, and it’s you that will make the difference. Thank you.